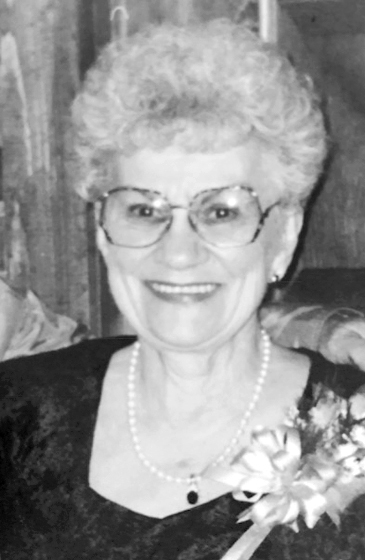 PALMER, MI – Elaine Olive Newman, 92, of Maas St., Negaunee and longtime Palmer resident, passed away peacefully Monday morning, July 23, 2018 at the Eastwood Nursing Center with her loving family at her side. Elaine was born July 16, 1926 in Crystal Falls to Guido and Cassie (Parker) Menapace, moved to Negaunee when she was nine years old and attended Negaunee Schools. She was employed as a nurse’s aide at Morgan Heights Sanitorium during her high school summers, and later as a custodian at the Palmer Nursing Home and for Negaunee Public Schools at Pineview School. Elaine met Joseph Newman and they were united in marriage one year later, moving to Palmer to raise their family. Mrs. Newman was a member of Mitchell United Methodist Church, Negaunee. She enjoyed singing and dancing, gardening, an occasional trip to the casino, and loved people and animals. She had pets from a skunk to a baby deer named Scruffy that she raised to become a beautiful doe. Elaine was an active C.B. radio member, known as ‘Teardrop,’ and she received a Certificate of Appreciation for her help with the Michigan State Police. Most of all, Elaine loved her family, and especially cherished time spent with her granddaughter and great-grandchildren. Surviving are her son, Joseph (Shirley) Newman of Palmer; granddaughter, Amy Lynn (Robert) Luke of Marquette; two great-grandchildren: Joseph Robert and Abigail Lynn Luke; and nieces and nephews. She was preceded in death by her parents; her loving husband Joseph H. Newman on June 28, 2001; and her brother, Harold Menapace. Honoring Elaine’s wishes, private family services will be held. Burial will take place at Northland Chapel Gardens. Memorial contributions may be directed in her memory to Mitchell United Methodist Church or the Eastwood Nursing Home Activity Fund. Mrs. Newman’s memorial page may be viewed at koskeyfuneralhome.com, where memories and condolences may be shared.